Yakima, WA – Primarily operating as a FOB Shipper, Borton Fruit aims to improve efficiencies and reduce the overall holding time of trucks. The goal is to check in, load and release a truck in no more than 1 hour (when the order is received>24 hours prior to ship date/time). Through strategic planning and operational improvements; Borton Fruit has ramped up the Quality Control inspection team and dedicated inspection/staging location proximity to the new vertical pallet racking system to increase flow of order loading. To accommodate the drivers that come out to our facility, Katie (Borton) Birley has recently designed a new lounge that has been remodeled from a former office space at the Borton Main Plant. 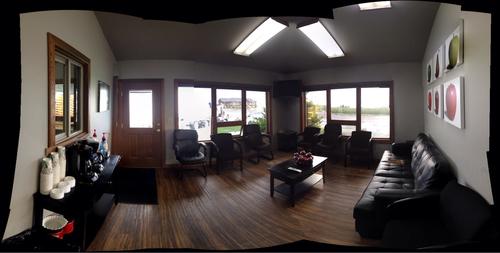 The lounge provides a relaxing and comfortable environment where the drivers can kick up their feet, enjoy a fresh brewed cup of coffee and/or an apple, while catching up on some news or their favorite show! Moving forward into this record breaking Apple harvest, our team here at Borton Fruit recognizes that in order to effectively execute the highest level of customer service, it is paramount to keep the trucks moving and do everything in our power to create an enjoyable loading experience while they are here. Without the dedication and hard work of our American Truck Drivers, the Washington Apple Industry wouldn’t be able to continue growth and provide the life-giving products that are enjoyed by millions all over the world. Thank You Truck Drivers! Come take a load off, while we put a load on.